This beautiful Victorian home features bay windows, french doors and beautiful hardwood floors as just part of its character. Located near downtown on an oversized lot, this house sits on a hill with mature trees and your own concord grapes. Over 2900 square feet of living space with large kitchen, dining room, living room, family room, laundry room and library/bedroom on the first floor. A walk up the master staircase leads to four bedrooms and a family room that could be used as an additional bedroom. Other features include a two car garage, two full baths, a large basement with workshop area, above ground pool, deck and patio. 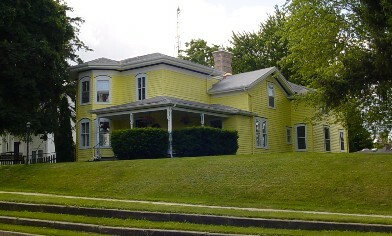 This home is listed on the state and federal register of historic places. This designation offers you significant tax benefits of up to $10,000. Follow the links on the left to see more pictures of this special property and please e-mail me with any questions you may have.